Comprehensive Operation Sinai (COS) 2018 is still in progress, with regular updates furnished by the Armed Forces. The counter-terrorist operation was launched in February and 25 military communiqués have so far been issued reporting on the inroads made not just against terrorist groups but against other criminal activities, especially smuggling. Since the original three-month deadline for COS 2018 was extended indefinitely, Sinai officials and security experts say the capabilities of terrorist organisations in the peninsula have witnessed massive erosion. Sources say operations will continue until they attain all their stated objectives, echoing Armed Forces Spokesman Colonel Tamer Al-Refaai’s statement that COS will only end when “all the assigned tasks are completed”. In the meantime, movement by residents of Arish, who have faced severe restrictions on transport within the governorate and on their ability to leave, will be eased, according to North Sinai Governor Abdel-Fattah Harhour. Local Sinai sources reported a terrorist attack on Friday at a roadblock near the border zone in Rafah. It was later confirmed that an officer and a conscript were killed in the attack and a number of others wounded. Judging by the sounds coming from the area, say the sources, the attackers probably used RPG rockets. Sources in the area report some of the terrorist operatives failed to make it across the border between Egypt and Gaza/Israel, and were captured by Egyptian forces. While it remains unclear whether they were heading to Gaza or seeking to escape to Israel, previous incidents suggest the operatives were seeking refuge in Gaza following a schism in Sinai Province, affiliated to Islamic State (IS). The leadership of the terrorist organisation is almost exclusively comprised of Palestinians from Gaza, some of whom defected from Hamas’ paramilitary wing while others had been dismissed from Hamas’ security services. There are an estimated 130 of these operatives in Sinai. Their numbers are swelled, however, by other Palestinians who have infiltrated Sinai in the last three years, and by yet others who have been involved in arms smuggling for even longer. An Egyptian security source told Al-Ahram Weekly that terrorist operatives pursued by Egyptian security forces often flee in the direction of Israel, an apparent confirmation of Israeli security reports suggesting Sinai-based terrorists sometimes prefer to flee to Israel rather than Gaza. Observers have noted a decline in the effectiveness of the terrorist organisations’ media operations. That the latest edition of the IS-affiliated Al-Nabaa reported the attack against the army roadblock using secondary sources supports the assumption that communications have broken down between IS and its regional commanders following the collapse of the organisation in Raqqa and the breakdown of the organisation’s structures in Egypt in the face of the sustained pressures of COS 2018. Details of security investigations made public last month revealed the existence of 43 cluster cells formed by Salman Al-Darz. Al-Darz became Sinai Province’s military commander after being responsible for finance in his capacity as one of the main contractors for border tunnels running between Sinai and Gaza. Security investigations in Gaza and Israeli intelligence assessments reveal that Sinai Province has for some time seen it as being in its own interests to put a brake on smuggling activities in order to harm Hamas which had long profited from the illegal trade, a reflection of the antagonistic relationship that exists between Hamas and IS/Sinai Province. 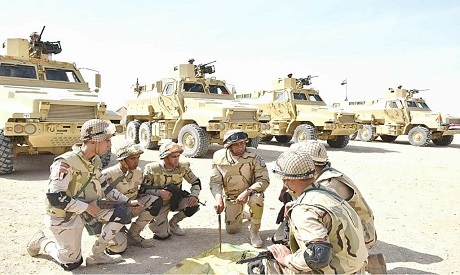 The cluster cells were located in six areas of North and Central Sinai — Beir Al-Abd, Sheikh Zuweid, Rafah, Arish, Al-Hasana and Nakhl — which coincide with Sinai Province’s operational divisions. Confessions obtained from IS detainees indicate that a structural change occurred in the Sinai Province leadership hierarchy after its commander, Abu Doaa Al-Ansari, was killed by the army in August 2016. Abu Hager Al-Hashemi, a former officer in the Iraqi army, took over the organisation after Al-Ansari’s death and reduced the senior command to just three deputies in an attempt to end infiltration. The group’s organisation was further eroded by the elimination of Nasser Abu Zaqoul, its commander in Central Sinai. More recent reports note the disappearance of news about Al-Hashemi, leading to speculation that a leadership crisis is underway. Security sources in Sinai told Al-Ahram Weekly military intelligence began to detect signs of an internal rift following the attack against the mosque in Beir Al-Abd in November 2017. The fissure has been of great help to counter-terrorist operations. “An important shift has taken place in the counter-terrorist drive in Sinai and in Egypt in the framework of COS 2018,” says Brigadier General Khaled Okasha, a member of the National Counter-terrorism Council.